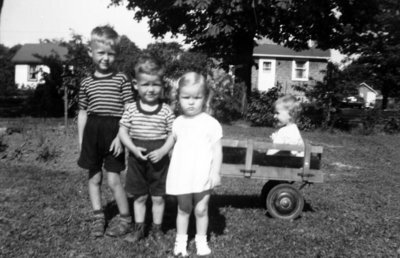 A black and white photograph of the Kirk children outside in the summer. From left to right: Robert Kirk, Ronald Kirk, Nancy Kirk. There is an unidentified child in the wagon. The Kirk Family, c. 1952, Photographer Unknown. Whitby Archives D2013_005_015.